Welcome to my blog for the Sew Mama Sew Giveaway Day. I have that beautiful Text Me a Rainbow Bundle of 15 fat quarters to give away. I purchased this bundle from my friend Becca at Sew Me a Song, in case you were wondering where one might find more similar unique fabrics. Becca is holding this bundle for me to ship to the winner, anywhere in the world. I hope you may have time to get to know me a little. Have a look at my the My Quilts page at the top of the blog (or click here) to see what I have been making and you can click the quilt names to go to blog posts about each one. That quilt above, Breathe, is one of my favourites, and will give you a bit of an idea of the kinds of quilts I like to make. Leave me a comment. Please share with me what sewing project you are working on and what you are dreaming of starting next. I'm always looking for inspiration for my next project. If you follow me somewhere, you can leave a second comment letting me know how and where. This giveaway is open to everyone, no matter where you live in the world. You have until midnight MST Sunday, May 11, 2015 to enter. I will use the random number generator to draw from the comments and announce the winner on Monday morning. Please make sure I can find you, if you are not sure put your email in your comment. I will immediately draw another winner if I can't find you. Good luck, I am sure you will be visiting the other giveaways linked up over at Sew Mama Sew! And if you would like to join in, I have another fantastic giveaway open until Saturday morning running on my blog here. Hi there, what a lovely, vibrant and colourful bundle this is. I'm currently working on my first large (double) quilt, which I've made for the spare bedroom of our new house, trying to get it through my sewing machine to quilt is proving to be an entertaining challenge. After that's finished I want to start work on a foundation pieced throw quilt as a gift for my friend at Christmas (fingers crossed I get it finished in time!). The most exciting project I have going right now is AMH's Dowry quilt which I'm making in all AMH fabrics. I'm smitten! 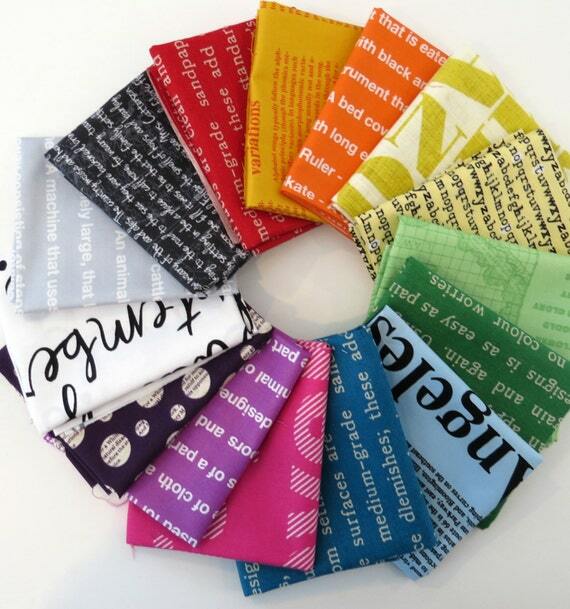 I would love a chance to make something with these cool text fabrics! What a beautiful bundle! I just finished a Preppy the Whale 🐳 quilt and I'm longing to do some foundation quilting! I have been working on a series of Mini Improv Wave pieces and hope to start on something paperpieced! I'm working on a Circle Lattice wall hanging (among other things)... thanks for the opportunity! I follow you everywhere; Bloglovin and IG. Your work is so inspiring (we have so much talent we have in Alberta!). This is a terrific bundle, Leanne! Thanks so much for offering it to your readers:D I have a bunch of projects on the go -- planning to use some scraps and make a Carolyn Friedlander Tangelo pillow, and I'm actually contemplating making another pillow similar to your Breathe design. Thanks again! I'm working on a pinwheel quilt with some of the fabric having an owl print.I want to either start a tulip or a cat applique quilt next. I'm also going to be making some owl potholders. My next project are some stuffed toys based on Adventure Time (one is a wee little earthworm wearing a priest's collar!). Then I'll work on a quilt as you go lap quilt for a trade I'm in. oh I do love this bundle! You kinda know what I'm working on - an improv cross quilt. Next? Something in black/gray/white for a local challenge - but I have no idea what yet! I am a long time follower! I follow you on Feedly. I'm making a disappearing 9 patch quilt (red, white and black). I have so many projects I would love to work on just need to have the money to buy all the supplies. I follow you on Bloglovin' and IG. I'm a big fan of your work! Lately I was working on some EPP projects (baby quilt and La Passacaglia quilt), but I can't wait to begin some machine pieced project. And as I know myself, it will be some paper-pieced project. Maybe you should get back to paper-piecing? I've seen that lately most of your projects were pieced. I'm working on 2 tops inspired by Sujata Shah's new book Cultural Fusions. Oh my gosh that fabric! I love fabric with words! I'm not working on a sewing project right now as we're getting ready to move into the house we're buying on the 15th! Once we're moved in I will have a dedicated home for my sewing machine and there will be no stopping me then! I am working on finally finishing a quilt top that I started three years ago. Love the bundle, thanks for the chance. I'm paper piecing Wild and Goosey, a Bonnie Hunter design, and making Stars in a Time Warp every week following Barbara Brackman's blog. I am working on 2 quilts right now. One for my grandson which I only need to make backing for then quilt and bind. The other is a table topper for my Mom for Mother's Day which just needs binding. Great giveaway! I'm currently finishing up a Geometric Slide quilt for my mother and in the process of piecing a Posy Patrol quilt. Next on my to-do list is a Molehills quilt. This bundle is awesome! 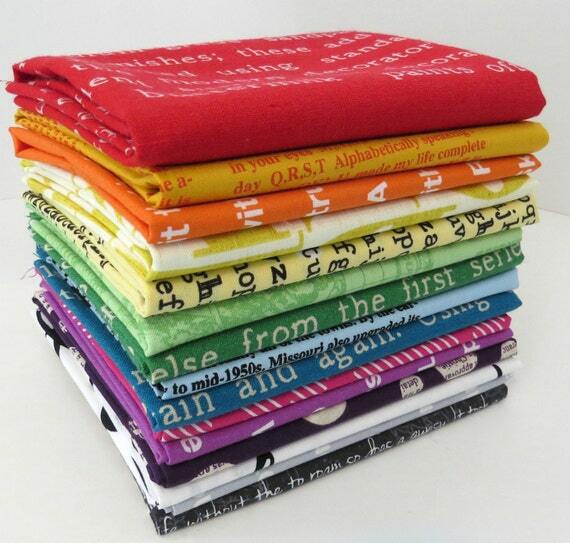 I LOVE textfabrics - and rainbows - both together - yummy!! I´m working on some tea pouches at the moment - and as soon as they are finished I can work on a scrappy triangle quilt for a good friend of mine! I am currently designing a graduation quilt for my nephew in reds, blacks and greys, so the bundle would give me some great help! Thanks! You are on my Bloglovin feed! Ohh, wow, I hardly ever enter a give-away anymore, but this is so lovely! I’m working on.... the Mod Pop Quilt. would you believe that? I’m dreaming of starting to work on the Patchwork City quilt by Elizabeth Hartman. Thanks for a chance to win this gorgeous stack of fabrics! I am currently sewing binding on a table runner. My next project will be an Optical Illusion quilt that will be a wedding gift. I’m following you through Feedly, Flickr and since a few days I’m on Instagram! Starting work on a memory quilt soon-just finishing up a Dr Seuss quilt for my grandson. I follow your blog on bloglovin. I love the texty prints that you chose. (and they would be great in that quilt for my son.) thanks for sharing the opportunity to win. I really enjoy reading what you're up to. I am working on a really large, oversized queen medallion quilt and will be quilting it up soon. I have so many current projects to finish that I shouldn't even THINK about my next one. BUT..... I' thinking of a making a whole bunch of HSTs and seeing where they lead me. my next project'll be a dress for my daughter! i finished a sew together bag at the weekend & now i´m working on a quilt for my friend. i use fat quarter from parson grays seven wonders-collection. i think the green and the orange fabric of this wonderful bundle here would fit perfect. I purchased a panel with western theme pictures-cabin with windmill, fence, covered wagon-maybe not so western. Trying to determine a layout for it. I really love the soft colors you choose for the Dance quilt. Thank you for a great giveaway. vkh6210 at gmail dot com. I'm trying to finish up 2 quilts for an exhibition deadline this Friday and dreaming of starting my technicolour Galaxy quilt with Pile o Fabric! I am working on a fun block for a swap just now. The theme is spring and loads of colour. So I am having loads of fun organising my scraps and just the most lovely shades of pink, yellow and blue. I have today finished quilting a small table cloth and for the moment that is today, I haven't planned my coming project. But this is today, tomorrow I have maybe started a new project. I follow you on Bloglovin. I got to see your Breathe quilt at QuiltCon and really liked it and your style. I also follow you on IG, and probably bloglovin! What a great bundle. I am following. I'm working on a modern paper pieced star quilt that I love! It will finish as a twin size for my daughter. I am making a quilt with batik Arrowhead blocks and Old Italian Blocks using Anita Solomon's method. I am alternating them with solid squares to have nice areas to FMQ. my machine is currently in the shop so I have been cutting, cutting and cutting. I have 8 quilts cut out and 7 swoon blocks cut - once I get my machine back I will be busy. Love the colors of your prize bundle. I'm currently making a Scout quilt with all solids... My first solids-only quilt! I am working on a rolling stone quilt for my niece. She graduates soon so I had better get busy! Thanks for such an awesome giveaway! I'm currently quilting a jellyroll baby quilt. Lovely bundle! I'm working on a St Louis 16 patch. I am working on May Chapell's All Squared Up. I pulled out an old project started in the '90's - a dimensional bow tie block. My son and I learned how to make them at the Dallas Quilt Show one year. He sat and made dozens of blocks for their donation quilts. The sweet ladies at the booth were happy to have a ten-year-old boy who was so precise and interested in doing blocks for them. While he sewed, I got to look at the quilts in the show. Working on this project brings so many memories of my boys when they were growing up. They're all men now - that 10 year old is going to be 30 this year! Where does that time go?! What a fantastic and generous giveaway. Thank you for the chance. I am working on many, many things at the moment. I like to have several things going, all at different stages. However, my newest project is a trip around the world throw using only blue fabrics. It's at my sister's request. I found this beautiful large floral print, and I didn't want to cut it up too much, so I'm doing 4" unfinished squares, and saving most of the yardage for the back and maybe binding. It's coming along nicely, and I'm using up a lot of my stash of blues. It's my favorite color, so I have a lot of it! I'm working on a few zipper bags at the moment, but I'd love to make a quilt with solids and triangles next. What a terrific bundle of fabric. I am currently working on gravity by Jaybird quilts and a Tula Pink Sampler quilt. samewers AT gmail Dot com. I am working on a graduation quilt with deer and ducks on it. I am working on a Fair Isle quilt for my daughter. I'm working on a paper pieced quilt for a baby on the way. I follow you in bloglovin. I am working on a picnic quilt with lots of cheery cherry fabrics. I have several samplers on the go as well. I'm currently procrastinating about starting the quilting on my first bed-sized quilt as I'm scared of it! I'm dreaming of getting back to my Bluebird Park quilt which I started and then abandoned, or starting a new project which will be a quilt with meaning including solids, low volume and text. Wow, what a cute selection of fabric! This is a gorgeous bundle! I am in the process of making a duvet out of drop cloths. I really love the look of a linen duvet cover but they aren't in my budget. I bought some RIT dye and dyed them a pearl grey color. Now I just need to sew them together and then make some fun accent pillow covers. I'm trying to redecorate our room before my husband comes home from.deployment. After that project I want to work on my black catvent quilt. I'm going to name it Binx. Hocus Pocus is my jam. Can't wait for Halloween season! I'm working on an embroidered girls dress, plus some bag pattern ideas! I've got a bunch of things on the go, but the most important one is the wedding quilt for my brother and his new wife. Thanks for the chance to win. I follow you on Bloglovin and IG. I loved seeing your Breathe quilt at QuiltCon! I'm doing a low-volume stripy quilt for a HS grad who likes CALM colors in her bedroom. I'm currently making a quilt for my niece (it needs to be finished by mid-July) and have spent the afternoon cutting out pieces for the backing. I'm also (still!) hand quilting my hexy quilt. After that I'll be continuing work on the bl**dy blue and white quilt which has been on the go for far too long and, quite frankly, I'm sick to the back teeth of it! After that (whenever that is - 2017?) I'm starting something for me! My next project is a baby quilt of Hazel the Hedgehog. Working on my half hexi quilt! I am currently on the home run of Charlotte (Displacement Activity's) paper pieced "Pervalong" QAL quilt and the next project I have in mind is Jen Kingwell's "My Small World" from Quiltmania - another QAL starting up soon. I need the pressure of public humiliation to keep me on track! Working on painting fabric with dye na flow paints. Gorgeous colors and I love all the text prints! I am working on finishing a few tops. I have Bonnie Hunter's Grand Illusion, and a farmer's wife sashing and corner stones. I'm working on my paper piecing and improv skills with a project for my family room couch! I am making a Moda Love block right now to give to my grandma for Mother's Day. It's being made from a Kona solids charm pack that I cut down to 2.5 inch squares, and is very multi-colored and all mixed up. It should finish at 12 inches square, and I plan on doing a puzzle quilting pattern across it. Thank you for the opportunity to win! I'm finishing up a pickle dish quilt, and pondering designs for maybe(!) making dorm quilts for my daughter and her roommate-to-be. Those would have to be something simple and quick, though! I follow you on Bloglovin, too. I'm currently working on an alphabet commission quilt. But mentally I'm working on my next quilt which will be a Dahlia quilt. I am working on a flowering snowball quilt, but veeery slowly, lol! I have been having withdrawal symptoms as I have been working on my quilt room and haven't had time to quilt. I am finishing up a Sew Together bag -- and I should (!) be working on the Park Bench BOM that I started last year and have left to, um, ripen for many months. I,m also learning to do free-motion quilting and have been spending time practicing that. Thanks for offering this beautiful bundle. I am making some bags, but my next project it will be a jacket or a shirt, still deciding which one will be more interesting! I am working on a quilt for a girl and next I want to make a bag. Thanks for the giveaway. I have been following you on bloglovin since you were featured on the Sew Mama Sew blog. 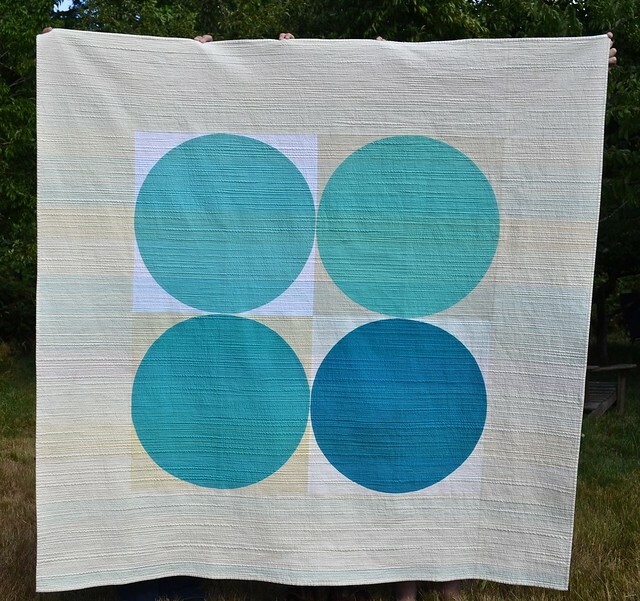 Your minimalist quilts with your matchstick quilting are spectacular. I love seeing your work. Love those fabrics! I have a pile of scrap projects on the go right now. One is that I am finally making an all HST quilt that will be arranged just as triangles in rows. Lately I've been making a lot of one hour baskets. They're very addictive! I'm a new follower via Google Blogger's reader. I am currently working on a pillow that I need to finish for Mother's Day. Not sure what will be next! Just putting the binding on an aqua and purple patchwork quilt. Also just finished folding my entire stash, now I need to sort it, although, having it random makes you look through the whole bunch when picking fabrics. I've just finished my mystery quilt from a workshop at Earthly Goods at Christmas. I need to quilt my Elephant Parade. This was a quilt along over at Sew Fresh Quilts. I also need to work on my UFO challenge from the quilt guild. Crap. I think the interwebs ate my reply. I am currently working on a simple pouffy quilt/comforter that was intended to stay at my house. But my oldest daughter had to put her cat down yesterday. I think it's destined for her since I am using pink hatbox tigers. I'm working on so many projects! My main focus at the moment is the "summer sand and stars" quilt that I'm making for a friend of mine. When that is done I'm going to make a jelly roll jam quilt for a friend who just had a little girl last month. I follow you via an old-fashioned bookmark. And I follow via GFC. What a great bundle! I'm working on the Tula Space Dust pattern right now and I love it! Just finished up some charity blocks. I'm dreaming of starting two Christmas quilts, but I've been "dreaming" of that for a couple of years. Maybe this will be the year. Thanks for the giveaway! I just started quilting last November. I made a queen-size Rainbow 9-patch quilt for my son, followed by a black, red, and white Log Cabin in January. In March I finished a Civil War blues & brown 3-Dudes quilt. In April I made a Batik Zipper wall hanging and now I'm working on a Rainbow Bear Claw quilt. Whew! It's like a sickness; when you start you can't stop! My husband is starting to get concerned! LOL! I am working on a row quilt and next I will work on binding a finished quilt! I'm working on a store sample right now and want to machine quilt a modern maple leaves next! I'm working on a dark blue, grey and off white drunkards path quilt, so these colorful fabrics are just what I need next. Awesome fabric bundle--would be perfect for the Steam Punk quilt I hope to start right after our guild quilt show in June! Lovely bundle Leanne! I'm currently working on getting 5 quilts finished for Siblings Together before the deadline of July. Once they are done , then I want to experiment with some paper pieced solid blocks similar to my UK mini quilt swap. I follow you on GFC and IG. I am working on 7 quilts right now - a mini tumbler, hand quilting another, applique on two, embroidery on another, hand piecing stars and La Passacaglia.